Scared Bunny is a solo project from Toronto musician and former guitarist of Preacher Hopkins' Speed Disorder, Vlad Skokovich. Utilizing multiple layers of guitars and effects, along with electronic percussion, Skokovich weaves a tapestry of searing energy and dark, tasty moods on his all-instrumental solo debut. Influenced by German bands like Tangerine Dream and Ash Ra as well as Pink Floyd, Skokovich nonetheless sticks to his guitars, but uses the studio to create the effect of an entire band, including the kinds of electronic sounds his influences utilized. Scared Bunny’s compositions delve into a wide range of styles and atmospheres, from the gentle and idyllic tracks Once Upon a Time..., Ghost of a River, and Never Mind, to the near metallic intensity of Neurotica and Bunny Chase. But whatever he’s playing, Skokovich always injects an element of strangeness into the sound, like the eerie wailing guitar that turns Bunny Chase into a frantic, fear tinged pursuit. Conrad’s Dance, with its heavily delayed guitar freak-outs is reminiscent of Manuel Gottsching’s Inventions for Electric Guitar, though it rocks a little faster and harder. Welcome to Disturbia is a moody rock track, with no little amount of queasy yet exhilarating paranoid feel to it. That same sensation is taken to its extreme with the disturbing, wailing guitar breaks and chilling percussion of the very appropriately titled Fear. In direct contrast is Lazy Joe, a laid back, swinging kind of summery jazz romp. Lucifer’s Cave is one of the darkest pieces on the album, and certainly the most experimental, with distorted percussive sounds blending with an eerie keening over weird noisescapes. Choke is melodic space rock at it’s best, with some truly scorching guitar work. The album ends, intriguingly, with the murky and mysterious Channeling, a rhythmless excursion of guitar drones, sobs, and moans. Disturbia looks back on the past, but has a distinctly contemporary sound too: the sounds of the city and nature colliding. It’s music that inhabits the spaces between light and shadow, as the sunset burns the edges of the night. 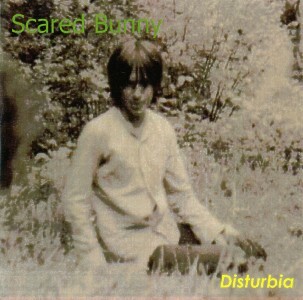 You can hear samples from Disturbia at: http://artists.mp3s.com/artists/600/scared_bunny.html. For more info, contact the artist by e-mail at: vskokovich@sprint.ca. Or by snail mail at: Dovla Music, 95 Gamble Avenue #407 Toronto, Ontario, M4K 2H7, Canada. For ordering info, e-mail: Peter@AnjelicRecords.com.